This word can conjure up all kinds of feelings in people from excitement and adventure to fear and trepidation. Regardless of the feelings it creates in you, if your church or ministry is looking to go from a traditional, age-segregated format to a more integrated, family ministry culture, there will be transition. And everyone involved is going to feel it in some way. The purpose of reFocus is to come alongside you and help you as you transition. We want to give you the tools, the resources, and the support necessary to not just make a change but to make a GOOD change within your church. The process of transitioning ministry is anything but cookie-cutter. Each church has its own unique set of needs, wants and values that must be considered during each step of the process. Time is needed to help everyone in the church and the ministry understand the need for change, allow the change, embrace the change and eventually become part of the change. To do this, reFocus helps you see WHERE YOU ARE, the good, the bad and the ugly, and WHERE YOU ARE GOING, the dreams, hopes and aspirations and creates a process of transitioning unique to your church by building on the good you already have and giving it more depth, meaning, and visibility within your church. 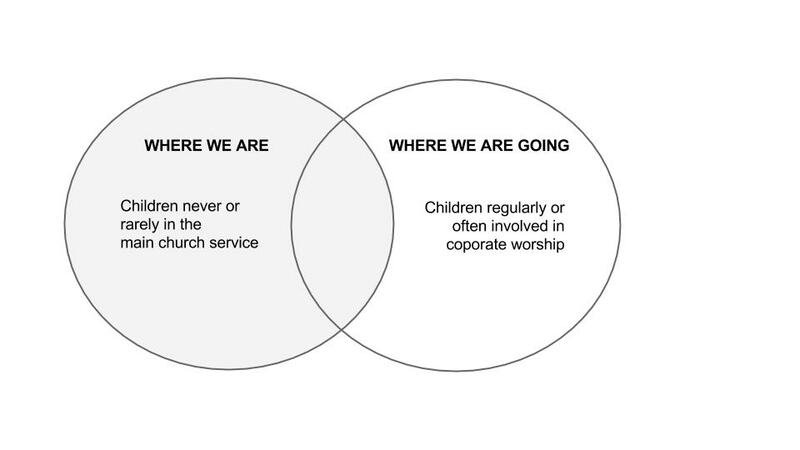 Below is a simple example from a church currently undergoing transition. The church has run on a traditional, age-segregated model for years and has recently adopted a curriculum that embraces a family-focused ministry. Among their goals was the desire to see children and families more involved in corporate worship instead of always in another room. Using reFocus’ methods for transition, the following diagram was created. What this allowed the church to do is consider some of the overlaps that existed from where they were to where they were going. For instance there were times the kids read Scripture in church. Each first Sunday they would come up from the basement and participate in communion. Through the years there were select times of recognition and celebration. So instead of just dumping 30 kids who had never sat through a church service into the pews, the ministers began to expand on the times the kids were already present. Families began serving communion together. Children were invited to help lead worship and parents participated in the reading of scripture each Sunday. Soon it was less and less unusual to see kids in the service context. Today, one of the three service is fully integrated for elementary-aged kids and families have an opportunity to worship together with the larger body in that context. We believe in the ministry of equipping the home and we believe it is in line with the heart of God for His church. Therefore we believe every church can make the transition given the right tools for the job. Let us help you as you reFocus your church and your homes. If you are interested in contacting reFocus for more information, please fill out the form below with your contact information and in the comment section, let us know what you are looking for whether it be resources, advice, prayer or community and we will do our best to equip you as you lead change.